There are Filipinos looking for work abroad. A lot of the jobs available overseas require a placement fee and an agency BUT not in South Korea. For Filipinos who want to work in the country, here is the updated process. Before 2017, applicants only need to pass the EPS-TOPIK or the Korean language test to qualify. This year, the POINT SYSTEM has been adopted and hiring will be based on the applicant’s score in EPS-TOPIK, Skills Test, and Work Experience (and Training). Remember that NO AGENCY is required as the process is by GOVERNMENT TO GOVERNMENT. THERE ARE NO SHORTCUTS TO THE PROCESS. First, learn Korean language. You could do this through a Korean language center or on your own, by self study. There are FREE KOREAN LESSONS on the internet. Second, wait for the POEA’s announcement to register. The registration for the Korean test or EPS-TOPIK is ONLY ONCE A YEAR. This happens in late January or early February so from now, interested applicants will have the time to prepare for the Korean language test. The test is usually given in March or April. After the Korean language test, the successful applicant also has to pass the SKILLS TEST (this started in 2017). Third, from 2017 experience and training counts! In the previous years, applicants need only to pass the EPS-TOPIK to qualify for the roster or list of eligible workers to Korea. From 2017, the skills test, experience in manufacturing work and certificates of training and qualifications given by the government will now make a difference. 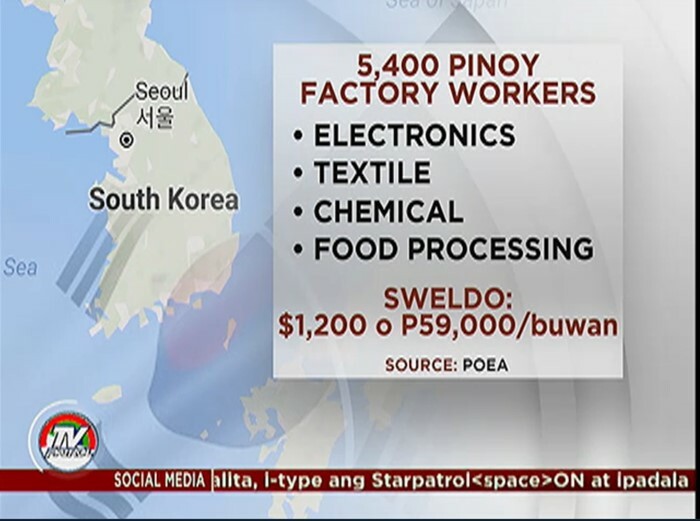 The jobs available in Korea for Filipinos are usually called 3D – dirty, dangerous and difficult. They require physical strength and a strong will. Before deciding if you want to work in Korea, consider the pros and cons first. ~ The minimum salary is regulated by the government. 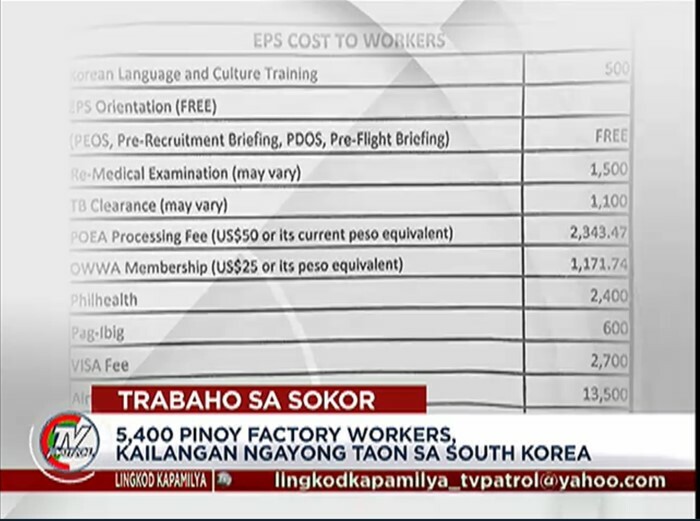 Foreign workers receive the same minimum as Korean workers. Check the MINIMUM WAGE IN KOREA FOR 2017. ~ Legal foreign workers are entitled to insurance such as health and national pension. ~ At the end of the sojourn, the foreign worker receives a “retirement” pay and could also get the amount paid for the national pension. ~ EPS workers can also get the chance to be a resident in Korea with the F-2-6 visa or change their status with the E-7 visa. ~ Initial contract is only for 3 years but it can be extended for a maximum of 1 year and 10 months. The worker can also be re-employed as a “sincere” worker. In total, the worker can stay and work in Korea for 9 years and 8 months. ~ Work can be difficult and there is a chance that employers will not allow overtime work (for higher compensation). ~ The E-9 visa is tied to the employer, so the foreign worker is not allowed to change jobs on their own. ~ The reality that some workers could end up with a not-so-nice and not-so-generous employer. ~ Some workers complain about the accommodation ~ like a lack of bed (some Koreans sleep on the floor) and living in a container van. ~ Some workers find it difficult to adapt to the culture… and FOOD! ~ Initial contract is only for 3 years. How much will it cost the applicant to work in Korea? How much can a worker earn in South Korea? This would really depend on the company and the actual time worked but the minimum for one month is about 55,000 PHP (based on the 2017 minimum wage and January 2017 exchange rate). Most of the time, the company provides accommodation and two meals a day. HOWEVER, some companies will charge for dormitory and meals. Check the contract! Is passing the EPS-TOPIK a guarantee that the applicant will get a job in Korea? NO. Passing the EPS-TOPIK and the Skills Test is only a guarantee that the applicant’s name will be included in the list of possible employees. Some people get picked and some don’t. Employees prefer men because of the nature of the job but there are women who are hired as well, albeit in smaller number. While there are more workers who experience fair treatment when it comes to wages and working conditions, it can’t be denied that there are those who are sometimes not paid or verbally and physically abused by their employers. The Korean government and NGOs have set-up migrant centers where foreign employees can seek assistance in times of trouble. This year about 35,000 applicants took the EPS-TOPIK. Only 7,003 passed the test. After that, they need to take the SKILLS test. Any work experience related to their job they’re applying for in Korea and any training they received will be added to their score. As the POEA Deputy Administrator Joselyn Sanchez said, the higher the score the better the chance of getting a job in Korea. For 2017, South Korea is set to hire up to 56,000 foreign workers under the EPS program. Of this total, only 5,400 will come from the Philippines. The others will be hired from the other countries in the EPS list such as Nepal, Bangladesh, Vietnam, Cambodia among others. Since the registration for 2017 is closed. The next registration will be next year ~ so prepare for that by studying the Korean language! Ano po ung passing score sa 2nd round nang skill test? Wala po bang exam nitong october? Please stop the exam for female’s while more females are still waiting thier approval and EPI. looking forward for klt12 & klt13.thank you and god bless. D n kaya mam mawawala ang colorblind. sAyang po kasi ung score kht mataa. Sa POEA website po, around January. PWEDE PO BGN MAG APPLY PAG NASA LABAS K NG BANSA? PAANO PO? Pwede naman po basta may paraan na makapagbayad sa Landbank ng registration fee. Tapos dapat nasa bansa pag magte-test na. Pede pa po ba magapply ahit nasa 40 years n idad? pwede po ba yung may tb na dati..
Pwede po ba mag apply ang MUSLIM sa KOREA??? Won ba ang sahod ng ofw? If so where do they change to peso? Can i buy? can a Filipino that lives in USA , under a green card, still apply from USA to work in Korea? Hi. Good morning. pwede po ba ang color blind with corrective contact lense? Big deal ba talaga ang color blind?